For more than six decades, The Rippel Foundation has focused on finding innovative solutions to America’s most demanding health concerns. To realize our vision, we invest in initiatives that are transformative in nature and in which others may not typically invest. With this strategy, we uncover and advance fundamentally new and different ways to improve health and well-being; ensure quality care; lower healthcare costs; and increase equity, engagement, and productivity. With our eye on the long-term, our immediate focus is to invest in (1) the creation of exemplars, where changemakers are disrupting the status quo, and (2) the continuous development and advancement of the conditions that enable these places to thrive. By 2028, The Rippel Foundation expects our investment will help realize a remarkable shift in national, state, and regional norms and improve health outcomes. We make shorter-term impacts in three interdependent areas to help changemakers redefine their perspectives, relationships, and processes so they can transform their health systems. We design and manage a robust learning agenda to gain a greater understanding of what affects health transformation. In the short- and medium-term, our partners are applying what we’ve learned in their practice, and are beginning to adopt our learnings as their own. For example, The Rippel Foundation invested in the development of the ReThink Health Dynamics Model. The Model simulates how a regional health system can respond to changes and opportunities, providing leaders with insights for decision making that often challenge their existing assumptions. Participants learn how different combinations of investment and funding are likely to unfold over 25 years across more than 200 metrics of population health, costs, care, equity, workforce productivity, spending, savings, and return-on-investment. 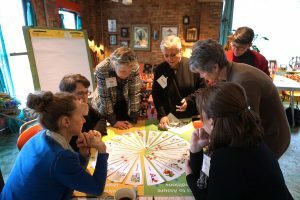 Today, hundreds of current and emerging leaders have used the model for their decision making, including partnerships in Atlanta, GA; Pueblo, CO; Cincinnati, OH; Greater Monadnock, NH; and Upper Connecticut River Valley, VT. Read how the Dynamics Model has shifted thinking and actions in these regions. We provoke a shift in mindsets and actions around how to improve health. In the short- and medium-term, we focus on direct engagement, network development, storytelling, and publication production and dissemination. Our partners increasingly perceive The Rippel Foundation as a thought leader in the field and have integrated practices and insights emerging from our programs. After ReThink Health, our flagship initiative, piloted a comprehensive community engagement and coaching program from 2012-2014 in partnership with Telligen (then the Colorado Foundation for Medical Care), the Centers for Medicare and Medicaid Services (CMS) declared the community engagement strategies to be “best practices” and incorporated them in their technical assistance network that includes hundreds of providers. CMS then asked ReThink Health to work with the National Coordinating Center for Quality Improvement Networks and Organizations (QIN-QIOs) to create an extensive coaching and leadership development program and offer it to different cohorts of providers over a five year period (2013-2018). In evaluating the impact of this work, 100% of the 2016-17 cohort reported that the program has met, exceeded, or greatly exceeded their expectations. In addition, 100% of participants would recommend these courses to others, naming tangible benefits such as increased confidence and ability to engage with communities, coach peers, colleagues, and coalition leaders, as the primary reason why. Another means of influence is The ReThinkers’ Blog, which is quickly becoming a must-read for regional and national changemakers. When ReThink Health stepped up the posting frequency in 2017, and began pairing our ideas with practical examples of where the ideas are already being implemented well, we started receiving many grateful emails and public compliments (in social media, on conference panels) from our partners and peers in the field. They’re saying the blogs have helped them to open new conversations with their networks–conversations they weren’t previously sure how to open. We empower leaders of regional initiatives on how to effectively execute successful transformation efforts. In the short- and medium-term, ReThink Health helps partnerships assess and make progress among the Pathway for Transforming Regional Health. The Pathway helps leaders understand what is necessary for system transformation and what they might expect in each phase of work. By 2028, The Rippel Foundation expects to see ten regions firmly situated in the transformative phases of work, supported by six states with supportive leadership, policy, and payer conditions. To learn more about our impact, we invite you to read stories from the field at rethinkhealth.org.